Established in 1984 to foster creativity and experimentation, Next Wave’s focus has always been on the next generation of artists in a changing world. Career development, presentation opportunity and multi-disciplinary representation have been integral since our inception. Over the past three decades we have empowered emerging artists to challenge our understanding of what art can be, where it takes place, and who will be watching. We’ve made art under freeways, in nightclubs, in private homes, at sports clubs, on wheat silos and through city streets. Next Wave has offered early career opportunities to many influential contemporary artists and curators, and our flagship art development program Kickstart introduced a new model to develop artistic practice and sustain careers, advocating the importance of time, networks and money in the artistic process. 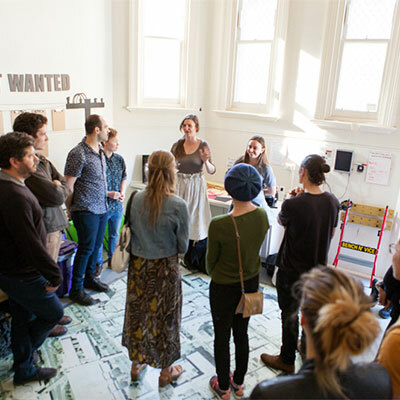 Now in its fourteenth year, Kickstart remains unique in Australia for its multi-faceted approach, depth and scale.